Alicia Wszelaki is the co-director along with Matthew Notherlfer, of ‘Camino, the journey to Santiago’ an intimate short documentary about a journey along the Camino de Santiago. The movie is premiered in Santiago de Compostela this week, as part of the first Film and TV Festival focused on the Camino de Santiago. 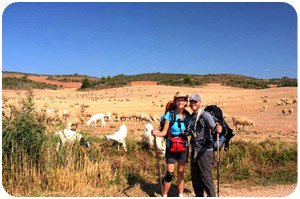 Alicia first found out about the Camino in 2010. Having completed the 88 Sacred Temples pilgrimage in Japan, she started researching other pilgrimage trails. Alicia decided to walk the Camino from Saint Jean Pied de Port to Cape Fisterra in 2011, with co-director Matthew. Along the way, they filmed the footage what it would later become ‘Camino, the journey to Santiago’. Maria from CaminoWays.com talks to Alicia about her movie and what moved her to produce a documentary about her experience on the Camino de Santiago. Listen to the interview on the CaminoWays.com podcast! I have seen the film and loved it. Alicia and Matt are very talented. I like how just listening to the music and seeing the beautiful and interesting film shots along the way makes me emotional and enjoy every minute of the film.